I pick up the box and it's pretty light. I see that it's 5 sandwiches clocking in at 12.5 oz, so 2.5 oz a sandwich. That's not super tiny, but it sure feels that way in my hand. I check the nutrition panel and sure enough these are a mere 120 calories a serving. That means I can have two right? Stupid white wrapper... so boring. Also, some objects may appear larger than they actually are. I take my first bite and fall instantly in love. 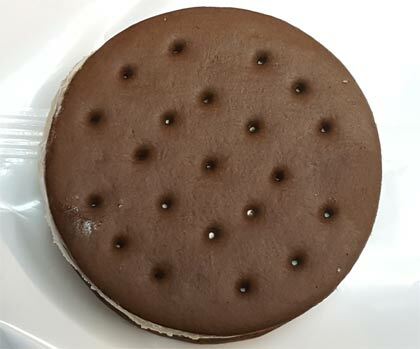 It's the classic chocolate ice cream wafer that I know and love, but now it's filled with the flavor and texture of caramel. It may not taste like a rolo, but it does taste good. Very good. I inhaled this first sandwich and enjoyed every bite. 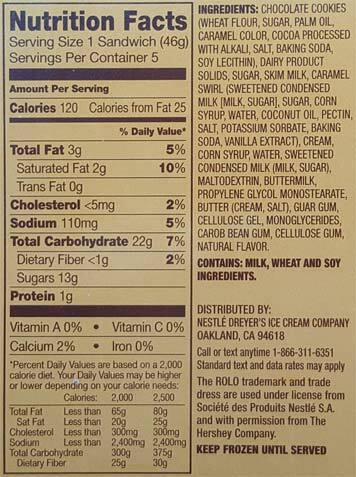 It's very close to the classic wafer to filling ratio that you find in a standard ice cream sandwich. This helps bring that happy familiarity home. I figured I would like these, but I really am shocked at how much. The caramel works perfectly here. It's not just a caramel swirl, it's carmale frozen dairy dessert. I don't really like FDD but due to the overall ratios as well as the crisp wafer texture, you don't really notice it. You'll be too distracted by the waves of rolo caramel swirled throughout the treat. And yes, I had two. One when I started my journey and the second when I got back. It was a bit softer (I prefer colder ice cream sandwiches) but I still inhaled it's tastiness. I am so glad they put these out. Simple but so effective. On Second Scoop: Since the ice cream is so light, these definitely need to be super cold to get the full effect. Definitely don't be afraid to give these a try. 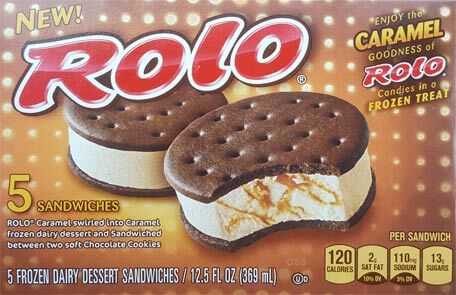 --- The funny thing is, I'm not sure these being good is enough to get me to try the Rolo cones... ahhh, it's probably enough reason. Pretty solid for what it is. I think the Hostess Ding Dong novelties were better however. Have to agree with this entire review. These were surprisingly awesome! One of my favorite novelties in a very long time.